COLD SPRING, NY--(Marketwired - Mar 18, 2014) - Patient demand for online appointments continues to grow. For providers, finding the right telemedicine partner can be a challenge. Price is often a driving factor, but building a sustainable online healthcare practice requires a balance of affordability and functionality. Whether you're a single provider in need of occasional video appointments or a large healthcare institution with high-volume remote patients, you need a platform that speaks your language. "A lot of platforms are touted as secure telehealth companies," said Daniel Gilbert, president and CEO of CloudVisit Telemedicine. "But the virtual meeting room concept is not designed for the security needs or day-to-day flow of a practice. And the open forum of a business meeting is not private or patient-focused." In hopes of transitioning to the healthcare market, some web-based video companies are encouraging doctors to use their platforms. But buyer beware; these corporate-minded business solutions offer vague details on user data storage and encryption practices -- information that's vital to protected health information (PHI) and HIPAA compliance. "Some companies, branded as secure telehealth, telemedicine, and telepsychiatry platforms, are simply renaming and marking up business tools with no additional features. CloudVisit brings much more to the table for a fraction of the price," adds Gilbert. CloudVisit Telemedicine's sister company, Aurora Information Technology, Inc. has a ten-year history in web and software development for the healthcare industry. As a custom-built SaaS telemedicine and telepsychiatry platform, CloudVisit allows providers and patients to easily schedule and conduct online video appointments. With CloudVisit, PHI and session data are fully encrypted and guaranteed by a HIPAA-required Business Associate Agreement (BAA). "We encourage providers to dig deep and know what they're paying for. 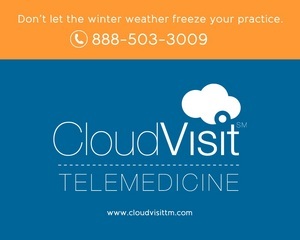 CloudVisit was designed specifically for the way healthcare practices operate, but many telemedicine platforms were not. Security and usability are our top priorities," Gilbert said.